There is a much bigger speculative fiction scene within China than most people realise. The main barrier to these stories for the western reader is of course language. It's wonderful to see writers such as Ken Liu translating important Chinese works so that a wider audience can begin to enjoy this rich and diverse market. 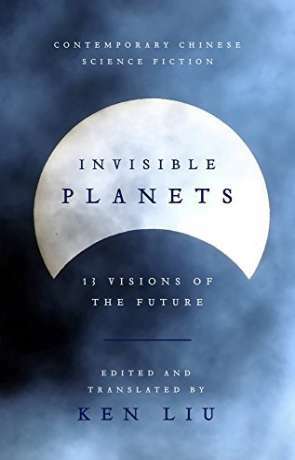 Invisible Planets collects eleven short stories, some of which have won awards, others personal favourites of Ken Liu. Many are from a young generation of rising stars within the community. There is also a great touch at the end of the book; three essays which provide insight into the Chinese science fiction scene. The first of these is written by the most famous Chinese science fiction writer - Liu Cixin - who provides a thoughtful history of Sci-Fi in China and also his own rise to prominence. Chen Qiufan writes about the younger generation of rising authors while Xia Jia considers what actually makes Chinese Science Fiction Chinese. As far as the actual stories go, each one is quite different and yet equally impressive - there are no weak stories you find in many collections. The fact that the collection is so diverse - the stories range from soft social fiction to real hard sci-fi - helps, as I am sure does Ken Liu's masterful translations. If they do share any theme then it's the lack of bright, optimistic futures - most are near-future or dystopian, reflecting the modern problems of fast economic growth and the increasing sense of inequality along with the influx of western cultural style. Even though to a western reader this may look to be a new, fledgling scene, the writing and intelligent, astute stories suggest a much more mature one. Invisible Planets is a wonderful collection, it's thoughtful and entertaining fiction that as a western reader opens your eyes to science fiction written by a different, rich culture. My favourite short story collection of the year. Written on 12th December 2016 by Ant.